One of my favorite Dr. Seuss books of all time is the story of the Sneetches. It’s a beautiful allegory of the way we work as humans – always coveting those who have something we don’t – even if it is just a star on our belly. 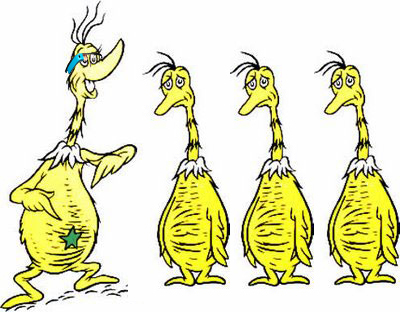 As a Glass Explorer, I can’t help but feel like one of the star-bellied Sneetches. My goal, though, is to not act like the sneetches. Rather than be exclusive or gloat my access to this new technology, I want to be inclusive and share it with others. I have lots of family and friends who work in education. I’m excited to share my Glass with them so that they can share it with their students. I’m curious to see and hear how they use it and what new applications they can come up with for it. The Glass Explorers program is an exciting adventure to be part of, and I’m excited to share it with those around me. This made me smile because the tale of The Sneetches was one of my favorite Seuss stories growing up. When we are young, pride and jealousy are so difficult to overcome sometimes. I know it probably took longer for me than most kids because I always felt jealous having lost someone at such a young age. I am looking forward to sharing Glass with many different groups, but I can’t wait to get together with some of the high schoolers from a non-profit I’ve worked with called Camp Interactive. They take inner-city and at-risk junior high and high school kids on wilderness trips and show them the world’s beauty, but also pair them up with tech startups for real world job-training. The creativity when we are younger isn’t bound by practicality or other constraints. It’s so refreshing, so I too can’t wait to see what they come up with. Great short but sweet post, Andrew. Awesome – thanks for posting. I’m all about using technology to help (re)-connect kids to nature! Sounds like a great project to be involved with.